Each player places their hands on the floor on either side of their controller. One player counts to three, and both race to perform the face-off. The face-off is performed using the ENGLISH control to drive the PUCK past oneâ€™s opponent. So, if it has just hit PlayerSpotOne, PlayerOne has control of the ENGLISH, but if it just hit PlayerSpotTwo, then PlayerTwo does. 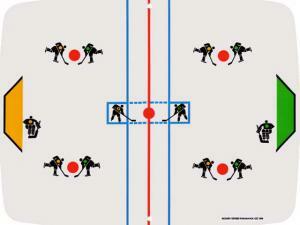 To make it fair, the players take turns counting to three before a face-off. Face-offs are actually a little fun. No, really, they are. Once. After that, meh. Invariably, the PUCK goes off the screen and that leads to another face-off, but this time it is closer to the goal. I guess the person who loses the face-off is supposed to race their paddle across the screen to try to deflect the PUCK back and begin a volley of sorts. You gain control of the ENGLISH after you hit the PUCK so theoretically, if your PlayerSpot is on the correct side of the center line, you can make a shot on the goal. However, we were never able to get a volley going. The â€œpuckingâ€ PUCK went off screen after each face-off, prompting another face-off. Our game consisted of many face-offs. The PUCK does exhibit a small degree of deceleration, so I guess that deflecting the PUCK after face-off would be possible, but neither my son nor I were able to achieve this level of mastery. It is possible that this game is actually supposed to happen with just a series of face-off "plays." This would make it more like Football than would be good for it. The manual does say there are 20 plays per period, but it doesn't strictly define a face-off as the play. Supposedly there's something that happens between face-offs that occurs, perhaps, at the tournament level of play, which involves two players furiously knocking the PUCK back and forth while trying to ENGLISH wiggle it into a goal. We never saw that. We stopped playing after about 15 minutes, unsure whether we sucked, didn't understand it, or the designers had left a great big hole in the documentation. One interesting aspect of the game that I do like, is the penalty described for a FOUL. A FOUL occurs when a goalie backs into his own goal (we never got to that point). The penalty given by the manual is that the player who committed the FOUL can only play with one hand for the next two plays! Isn't that so metaludological? The idea of a videogame with a rule extending into the outside world? Kind of like "if your opponent scores, drink your beer!" or "if the puck goes off the screen, you can't drive for two days!" I'm going to have to give this game credit for confusing us enough that we would've missed about half of Ultraman accidentally while trying to figure out what the instructions meant. Plus, I really liked the penalty extending out of the game to affect a playerâ€™s behavior. So . . . Hockey gets half a point. Next entry will be Ski. Nice reviews though. This system isn't yet emulated right? Since it's analog, I don't believe it can be emulated, only simulated. You're not missing anything. I have one fairly complete for historical purposes. Any average Pong system is more capable in many ways, though certainly the Odyssey feigned flexibility and advanced technology through overlays and rather flexible movement options (not to mention a light rifle option). The "chronogaming" reviews are pretty much spot-on. By the way, the Odyssey was released in 1972 by Magnavox, so this year is the 35th anniversary of home videogames. It wouldn't be until 1975 that through Sears, Atari would release home Pong, where the arcade version was more than a little inspired by an early Odyssey prototype that Ralph Baer just happened to see. We wouldn't see the first true cartridge-based system until 1976, with the Fairchild Video Entertainment System (VES, later known as the Channel F). While the Odyssey used something that seems like cartridges, all they were were boards with jumpers that turned various built-in system features on or off. The "chronogaming" reviews are pretty much spot-on. To me, these games aren't "great plays" for the most part, but after finding it nearly impossible to find actual descriptions or manuals for these games on the internet, I thought it would a good thing for me to do. (The manuals are out there now, btw, I scanned them all and posted them to a manual archive somewhere. The people running the site hadn't even heard of the Odyssey. Heh.) I've also scanned and processed every printed surface of my once complete Odyssey collection. All except the damn box for the proprietary RF switch box. Cripes. Bill, thanks for promoting my entry to the front page. I went in and edited something and I guess that demotes it again. I'll try to be certain I post my "final" entry next time so I'm not demoting my efforts unwittingly. Well, when the posts are like this, it's a no brainer to promote them to the front page. It doesn't take much, just some decent writing, a reasonable topic and a bit of length. Yours easily exceed that criteria. We definitely appreciate the contributions. I'll see if I have the box for the switchbox. I probably don't, but I can't be sure until I open up the storage case with the Odyssey again. I'm finally very close to unpacking my entire collection. I'm very excited, but there's still some work left to do in that regard. Yeah, this is old, but I just want to point out a fun little tidbit. "Hockey", as described in the manual, is ridiculously ill-concieved. See, the idea is that for a goal to count, you must be on your opponent's part of the field when making the shot. As you start off on your own field, you can't possibly score this way. If you hit the goal, you will simply start another face-off at the center. If you miss it, however, the face-off will be held elsewhere - hit the puck off the side of the screen, and it will be held on your side of the field, giving your opponent a chance to actually score a goal that counts. Hit it off the top or bottom, and it's an offside, making the face-off at the point closest to where it went off - which should be near your opponents goal. So, if you win the puck during the faceoff, you don't actually want to score, but instead send the puck offside and get a new faceoff you can actually score from. And there's more - if you hit the puck offside, then send it back onto the field (essentially, sending it over the top/bottom, then straight back again) a goal counts no matter what. The game essentially revolves around trying to get the puck offside on your opponents side, or even better, send it offside, then back "onside", in which case you can score. If you didn't get the puck, it's thus in your best interest to zoom towards the goal, ready to defend it in case your opponent does that weird offside-onside shot. Since both players must react quick, and you don't have to touch the puck more than once to do this, this means that, at playoff, both players zoom to their respective goals, while turning the English knob in case they're the one to control the puck. In other words, it's a hockey game with two players who both speed to their goals while the magic puck flies around on the field on it's own, trying to fly offscreen, then onscreen and into the goal.